We’d be lying if we said we weren’t fans of Vapamore’s steamers. We’ve reviewed the compact Amico and the professional-grade Forza in the past, and had nothing but great things to say about both. Now, we’ve finally gotten around to spending some quality time with Vapamore’s main consumer model, the MR-100 Primo. The Primo is the oldest of the three designs, and has been a top-seller of ours for a couple of years now. We like it so much that the unit covered in this review (and shown in the pictures and video) is not a sample from Vapamore – it’s our in-house steamer. While the handheld Amico is designed to be as simple as possible, and the Forza is built like a tank with top-end features, the Primo sits somewhere in between. The body and attachments are mostly plastic, resulting in a fairly light package. However, the materials don’t feel cheap or fragile, like some steamers in this price point (and below). The boiler is made of stainless steel, and is extremely tightly made – after being stored away for almost a year, the tank still maintained its pressure, hissing at me as I opened the filling cap. Vapamore is so confident in their boilers that they offer a lifetime warranty on them; the rest of the steamer (housing, accessories, stuff like that) come with a 1-year limited warranty. The attachments snapped together very easily, and could be locked in place with a simple twist. Vapamore has clearly optimized their steamer designs for convenience – the Primo has everything you need and nothing that you don’t. The rubberized wheels are large and mobile, and the handle on top is well balanced. The retractable cable is an especially nice touch. My favorite part of the design is the rear storage compartment. A simple clear lid lifts up to reveal slots for all of your attachment heads. Insert each head into their slot and twist to lock them into place. There’s also room for the micro fiber cloth. Vapamore has never left me hanging when it comes to accessories, and once again they do not disappoint with the Primo’s assortment. There are 9 heads, enough to tackle anything you’re bound to encounter. There are also three extension tubes, two cloth covers, a measuring cup, and a funnel to make filling easier. If you’ve watched any of our steam treatment videos, you already know that we recommend using the smooth-surface fabric tool with the cotton cover for bed bug jobs. This rig allows heat to be concentrated to a tight point, which is essential when treating for bed bugs. Setting up the Primo is easy. Just unscrew the tank cap, fill it with water, screw the cap tightly in place, and press the power button. It will take about ten minutes for the tank to come to a boil; once the left indicator light turns on, you’re ready to start steaming. The Primo is considered a dry vapor steamer, since its high pressure allows it to deliver dryer steam than your run-of-the-mill steamers (although it still expels water, of course). The Ceme solenoid, from Italy with love, allows the Primo to deliver consistently hot and dry steam by pushing steam on-demand from the boiler to the steam gun. It only took a few seconds after pulling the trigger for steam to come out in full force. On high steam settings, the Primo is a powerhouse, delivering over 50 PSI of 200-degree steam. For killing bed bugs on contact, we advise turning down the steam using the adjustment knob to avoid blowing bed bugs around. On low steam settings, the surface of the fabric attachment became extremely hot. All in all, the steaming experience is a pleasure with the Primo; it has a steam tip temperature that’s on par with other steamers in its category, and its water capacity pulls it well ahead of the pack, allowing for a longer steam time between refills. It’s easy to see why the Vapamore Primo has been our top-selling bed bug steamer since its inception. It’s purpose-built for both professionals and homeowners alike, delivering lethal heat at high pressures while never sacrificing convenience or ease of use. We will continue to use the Primo for extermination and cleaning duty here at Bed Bug Supply; I can’t think of any better way to suggest that we recommend it. 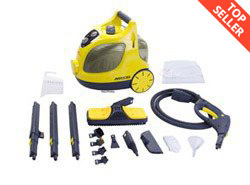 The Vapamore MR-100 PRIMO dry vapor bed bug steamer kills bed bugs on contact with the power of steam. The Vapamore PRIMO also cleans without chemicals.